Today I biked in Toronto for the first time…and I survived. I headed to Charlie's Bike Joint in the morning to purchase the bike I found the day before. 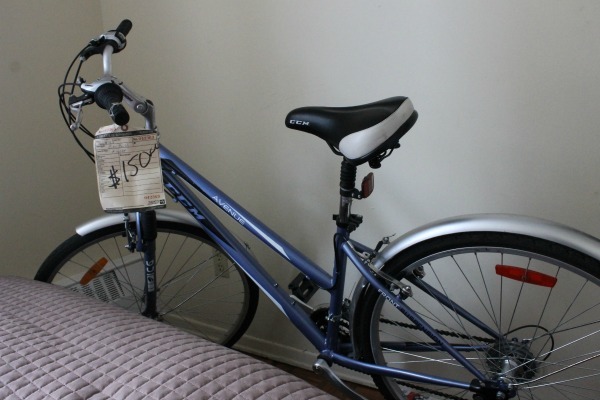 When I arrived, I saw the gleaming "blue gazelle" bike parked near the front doors. I started searching for my wallet when the man working suggested I take it for a test ride first. It didn't occur to me to take it for a test ride. I still wasn't sure if I was going to actually bike my bike home. My idea was to walk it to a quiet side street to practice. But I nonchalantly agreed and maneuvered the bike outside — forgetting my helmet on the front desk. I instinctively hopped on and popped the kickstand back — a familiar feeling kicking in. I waddled on my toes a few feet towards the street, looked for oncoming traffic and pushed my foot off the curb. 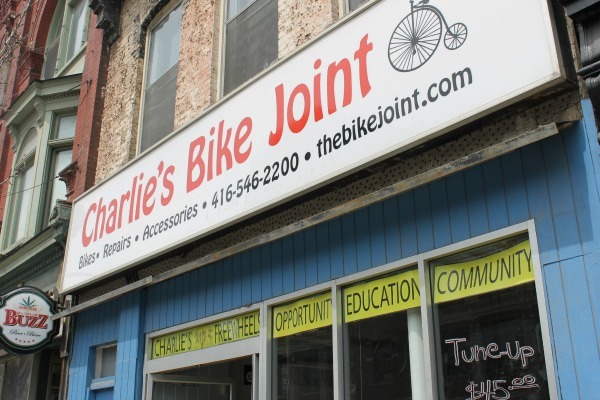 Charlie's Bike Joint on Queen and Sherbourne. Wind whooshed my hair back and I was jolted with childhood nostalgia. My eyes started crying — from the wind. (Definitely from the wind.) The bike felt comfy and I pedalled fast. I biked a square route through the neighbourhood, eventually coming back westward on Queen Street. I felt exhilarated, like I had just taken a shot of tequila. Once she was mine, I pushed her a few steps away from the shop's front windows and put on my helmet. I couldn't get it to clasp under my chin at first, but after a few minutes of fiddling and straining the straps together, my helmet was secured. Having already proven that I can bike a few streets in Toronto, I thought I would head up Sherbourne: arguably one of the safest in Toronto for biking because it has cycle tracks. Whenever I walk up Sherbourne Street, I usually see bikers huffing up the slow grade with strained looks on their faces. I always thought they were out of shape and being over dramatic. Walking up Sherbourne, I hardly noticed there was a gradual incline. Sherbourne bike lanes, with an incline deceptive to the first-time cyclists. Biking up Sherbourne for the first time, well, my heart started to pound. My chest heaved. I switched to my lowest gear and pedalled (and moved) very slowly. I said a small prayer for the red light to turn at the top of the hill. I grew self conscious of my breathing as people passed on the sidewalk. I closed my mouth. But I was sure they could hear me exhaling through my nose. The light turned green and I was startled by a biker who passed alarmingly fast and close. Somehow he had resisted the Sherbourne Street incline. His movements were smooth and he had very prominent calf muscles. He grew smaller as he gained distance far down the road. Onwards I biked past Bloor Street into Rosedale, practicing my riding skills amongst huge and leafy overarching trees and expensive houses. I felt Zen biking throughout Rosedale, smelling fresh-cut lawns and enjoying the winding (flat) streets that put my thigh muscles at ease. I encountered only a few vehicles on the road, and for the most part I was alone. I was shaken from my dream-like ride when I rolled through a four-way stop, impeding a car's right-of-way. The man inside honked and braked abruptly close. He threw up his hands and mouthed profanities. I then became acutely aware of my surroundings for the duration of my ride home. 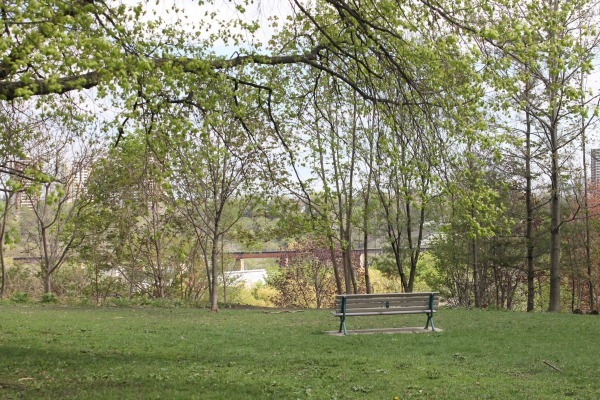 Chorley Park in Rosedale, which provided peaceful terrain for a leisurely bike ride. Home and high off endorphins, I immediately wanted to go biking again. I quickly searched Google Maps and settled on visiting Chorley Park in Rosedale. I thought I would keep up with the day's Rosedale theme. After a 15-minute peaceful ride, I walked my bike through the grassy park to a nearby picnic table. I was the only one in the park (a stark contrast to Trinity Bellwoods). I sat, admired my bike, and through the trees could see cars below on the Don Valley. Summing up my first experience, I would compare it to five years ago when I passed my road test and drove alone for the first time. 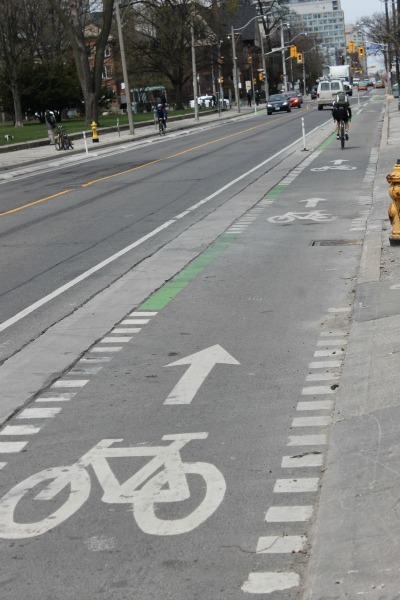 Learning to bike in Toronto does feel like learning to drive a car. It's a new found means of transportation that makes the city feel a lot smaller. Last year, I mostly relied on walking to get places and I became so accustomed to the incredibly long amount of time it took to get anywhere. Now, I have a vehicle that doesn't need gas that I can easily park inside my bedroom. This article first appeared in May on Jenna's personal blog. Since then, she's biked the seven minute commute to and from work almost everyday, however, congested streets with streetcar tracks and making left-hand turns with traffic still intimidates her. Stay tuned to the dandyBLOG to read about how she adapts to Toronto's streets as a new cyclist. 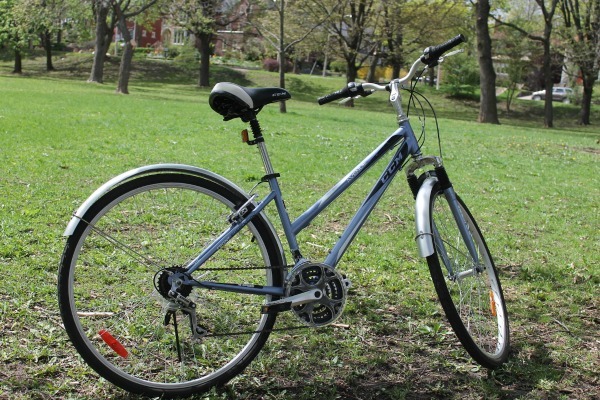 As the new dandyhorse web editor, she will be writing about different bike routes across Toronto every month from a complete "newbie's" perspective. Any tips from veteran riders are kindly welcomed!